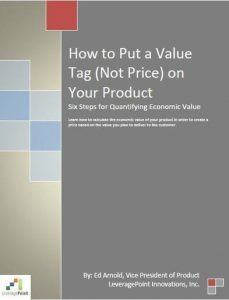 Every product has a price tag, but you never see a “value tag.” A value tag tells the customer, “What’s it worth for me?” to buy the product. Economic theory says that customers are willing to pay more for products that deliver them a higher value. If every product in the world had a value tag, then selling products would be much simpler than it is today. But few, if any, do and that’s because most sellers think that calculating value is too difficult. Actually, calculating the economic value of your product is easier than you think. 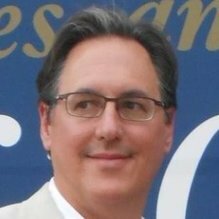 Ed Arnold is VP, Products at LeveragePoint, a company he co-founded in 2009. At LeveragePoint, he directs product design and development and drives the go-to-market strategy. Previously, he held senior positions at Monitor Consulting, Communispace, Diamond Management & Technology Consultants, and OmniTech Consulting Group. Mr. Arnold holds an MBA in Marketing from New York University and MA and BA degrees in Political Science from Boston University. His chapter, “Making the Case for Value-based Pricing Software in B2B Markets” was featured in the popular book, The ROI of Pricing.